Subtext? What the heck is subtext? You use some innuendos and a few mixed signals and you're good, right? Subtext is much deeper than that and, if used correctly, can make a HUGE difference in the way a story is set up. It can make a HUGE difference in the way characters act. And, it can make a HUGE difference in the way, ultimately, a reader perceives a story. 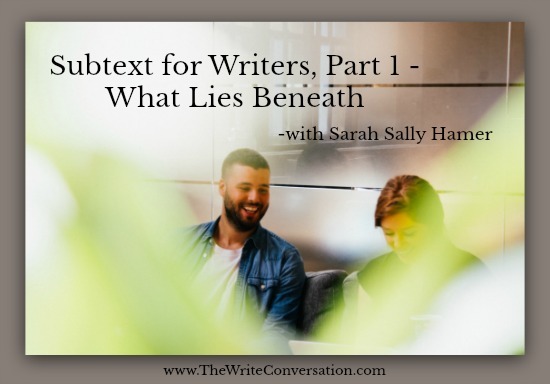 So, creating a layer of “what lies beneath” your story with subtext can rivet your reader to the page, wanting more. Which is what we want, right? One of the most interesting things I've discovered over my years of writing is that, even though we're creating fantasies, we're still talking about human nature - at every level. Subtext is no different. So, let's discuss real people first. Dr. Rachel Ballon says that, "as children, we start our lives with text, but then learn subtext as we come to understand social behavior, social norms, what is acceptable and what is not” (Seger, 7). Think about a child's direct and literal interpretation of the world. If he thinks someone is ugly, he will have no trouble saying that, out loud and in front of anyone who will listen. Most parents will immediately correct their child and teach them a more socially acceptable way of stating their opinions. Thus begins the subtext, which - at least in part - disguises the true intent of the child's meaning. Some subtext is conscious and deliberate. But some is unconscious and sometimes we want our characters to not know what they’re doing. Uncovering a character’s inner motivation can be amazing and can create a huge bond with our readers. Just like Shrek and Donkey understand that ogres have layers like an onion, so too do we understand our characters. Each character will bring motivations and reasons to the table when the story starts. This information should not be dumped on a reader, as if the reader needs to know all about a character from the very get-go. Instead, through subtext, the reader will grow to understand a character in the same way we begin to understand - and grow to like - the people who become our friends. There are several different ways to express subtext in a story. Next month, we’ll detail the ways to express subtext in Part II. How do you let your characters be themselves while still being polite? Any good ideas? Don't Miss the Other Posts in the Series! Sarah (Sally) Hamer is a lover of books, a teacher of writers, and a believer in a good story. Most of all, she is eternally fascinated by people and how they 'tick'. She’s passionate about helping people tell their own stories, whether through fiction or through memoir. Writing in many genres - mystery, science fiction, fantasy, romance, medieval history, non-fiction – she has won awards at both local and national levels, including two Golden Heart finals. A teacher of memoir, beginning and advanced creative fiction writing, and screenwriting at Louisiana State University in Shreveport for over twelve years, she also teaches online for Margie Lawson at www.margielawson.com. Sally is a free-lance editor and book coach at Touch Not the Cat Books, with many of her students and clients becoming successful, award-winning authors. You can find her at www.sallyhamer.blogspot.comor on Twitter @sarahsallyhamer. I wish to express gratitude to the giants whose shoulders I stand on and who taught me so much about the writing craft. I would list every one, if it were only possible. Outstanding writing tips.Thank you for sharing your wisdom. Hi, DiAnn! Thanks for coming by! Thanks, Grace! It is all about the "intentionality"! Good for you! I needed this good advice on subtext. You have explained it so well. Thanks for helping all of us become better writers. Hi, Jackie! I'm glad it helps!